Interference between similar or overlapping memories formed at different times poses an important challenge on the hippocampal declarative memory system. Difficulties in managing interference are at the core of disabling cognitive deficits in neuropsychiatric disorders. Computational models have suggested that, in the normal brain, the sparse activation of the dentate gyrus granule cells maintained by tonic inhibitory control enables pattern separation, an orthogonalization process that allows distinct representations of memories despite interference. To test this mechanistic hypothesis, we generated mice with significantly reduced expression of the α5-containing GABAA (α5-GABAARs) receptors selectively in the granule cells of the dentate gyrus (α5DGKO mice). α5DGKO mice had reduced tonic inhibition of the granule cells without any change in fast phasic inhibition and showed increased activation in the dentate gyrus when presented with novel stimuli. α5DGKO mice showed impairments in cognitive tasks characterized by high interference, without any deficiencies in low-interference tasks, suggesting specific impairment of pattern separation. 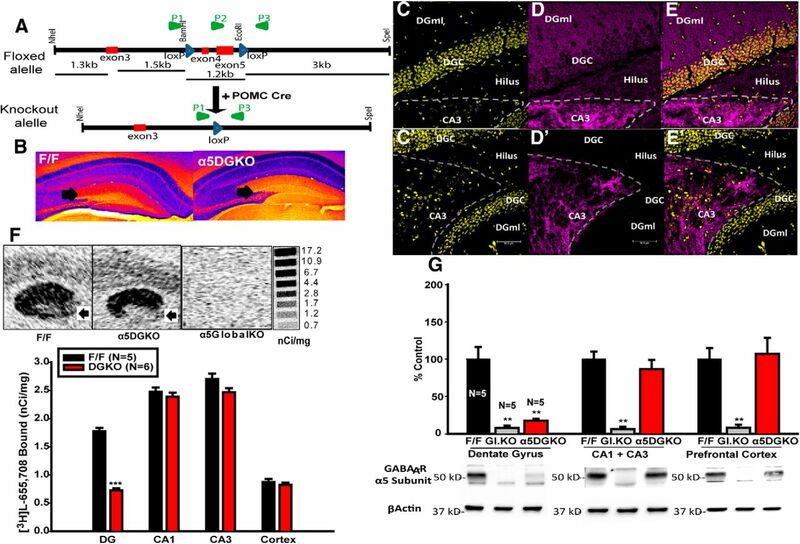 Reduction of fast phasic inhibition in the dentate gyrus through granule cell-selective knock-out of α2-GABAARs or the knock-out of the α5-GABAARs in the downstream CA3 area did not detract from pattern separation abilities, which confirms the anatomical and molecular specificity of the findings. In addition to lending empirical support to computational hypotheses, our findings have implications for the treatment of interference-related cognitive symptoms in neuropsychiatric disorders, particularly considering the availability of pharmacological agents selectively targeting α5-GABAARs. SIGNIFICANCE STATEMENT Interference between similar memories poses a significant limitation on the hippocampal declarative memory system, and impaired interference management is a cognitive symptom in many disorders. Thus, understanding mechanisms of successful interference management or processes that can lead to interference-related memory problems has high theoretical and translational importance. This study provides empirical evidence that tonic inhibition in the dentate gyrus (DG), which maintains sparseness of neuronal activation in the DG, is essential for management of interference. The specificity of findings to tonic, but not faster, more transient types of neuronal inhibition and to the DG, but not the neighboring brain areas, is presented through control experiments. Thus, the findings link interference management to a specific mechanism, proposed previously by computational models. The hippocampus plays an important role in the formation of long-term declarative memories and the flexible retrieval of these memories under appropriate conditions (Tulving and Markowitsch, 1998; Yassa and Stark, 2011). An important challenge for the hippocampal declarative memory system is the fact that many of our experiences involve highly similar components, which leads to interference between memories formed at different times. Memory interference is a major limitation on memory capacity in computational models, and cognitive dysfunction under conditions of high interference is a key cognitive symptom in many neuropsychiatric disorders, including schizophrenia, mood disorders, and autism spectrum disorders (Bennetto et al., 1996; Torres et al., 2001; Bowler et al., 2010; Shelton and Kirwan, 2013; Das et al., 2014). Pattern separation has been suggested as a computational solution to the problem of interference in memory systems (McNaughton and Morris, 1987; O'Reilly and McClelland, 1994; Treves and Rolls, 1994; Kesner and Rolls, 2015). Pattern separation is the reduction of interference through removal of redundancy from inputs such that even highly overlapping memories can be represented orthogonally. The dentate gyrus (DG) has been noted as a well suited region to handle the task of pattern separation, because of both its upstream location from the associative network of CA3 and its anatomical and functional characteristics. More specifically, tonic inhibitory control of DG granule cells (DGCs) by GABAergic interneurons ensures sparse activation within the granule cell layer, which results in sparse but strong connections onto CA3 pyramidal cells (Jung and McNaughton, 1993; Leutgeb et al., 2007; Petrantonakis and Poirazi, 2015). It was proposed that these sparse activation patterns maintained by tonic inhibitory control ensure the orthogonalization of the input from entorhinal cortex, even for highly similar stimuli (O'Reilly and McClelland, 1994; Rolls and Kesner, 2006; Aimone et al., 2011; Kesner and Rolls, 2015). The involvement of the DG in interference reduction has been demonstrated through studies providing at least partial empirical support to computational models (Gilbert et al., 2001; McHugh et al., 2007; Sahay et al., 2011; Morris et al., 2012; Neunuebel and Knierim, 2014). However, the mechanistic proposal that tonic inhibitory control of DGCs, which maintains sparse activation patterns in the DG, is required for pattern separation under high interference has never been tested directly. To control tonic inhibition of DGCs without affecting fast phasic inhibition in DG or affecting inhibition in the rest of the hippocampus, we generated mice mostly lacking the α5-subunit-containing GABAA receptors (α5-GABAARs) specifically in the DGCs. α5-GABAARs are expressed strongly in the hippocampus, typically extrasynaptically, and have been shown to contribute to tonic currents (Caraiscos et al., 2004; Glykys et al., 2008). The contribution of α5-GABAARs to tonic currents in the DG has been shown to be only moderate (Glykys et al., 2008), making a severe cognitive phenotype extending beyond high-interference situations unlikely. We found that the DGC-selective knock-out (KO) of α5-GABAARs (α5DGKO) leads to a phenotype that would be consistent with impaired pattern separation, as indicated by deficiencies in tasks characterized by high interference, without affecting performance under low-interference conditions. As noted above, the relative quiescence of the DGC layer is thought to be an important component of the pattern separation function of the DG. Population excitability is regulated by tonic inhibition, whereas phasic inhibition mediates transient, fast-paced inhibition at the synapses (Farrant and Nusser, 2005). We found that reducing fast phasic inhibition of the DGCs via α2-GABAARs did not affect performance under high interference, confirming that the overall excitability of the DGC layer is the critical factor. Similarly, KO of α5-GABAARs downstream from DG, in CA3, did not impair pattern separation despite increasing activation in CA3. In addition to providing empirical support to some of the mechanistic insights of computational models, our findings may have implications for the neuropathology of interference-related cognitive symptoms in neuropsychiatric disorders. A replacement-type targeting vector (total genomic homology, 7.2 kb), containing the putative exons 4 and 5 of the Gabra5 gene flanked by two loxP sites 1.2 kb apart, was constructed. The neomycin resistance cassette and a herpes simplex virus thymidine kinase expression cassette (NEO-TK) were placed between the 5′ loxP site and an additional loxP site. The targeting vector was electroporated into embryonic stem cells derived from the mouse line C57BL/6N (Eurogentec), and correctly targeted clones were identified. Targeted ES cells were then transfected transiently with a Cre-expressing vector to select clones with NEO-TK cassettes excised selectively. ES cell clones were injected into blastocysts resulting in germ-line transmission of the floxed allele (Gabra5tm2.1Uru; see Fig. 1A, top). The floxed allele was bred to the C57BL/6J background (The Jackson Laboratory) for at least 13 generations and crossed with POMC–Cre mice (McHugh et al., 2007; obtained on a C57BL/6 background and backcrossed to C57BL/6J for at least six generations in our colony) to eventually yield homozygous floxed mice expressing POMC–Cre (i.e., α5DGKO; see Fig. 1B–E′). All offspring were genotyped to check for possible germ-line recombination using PCR primers: P1, TTTAGTGTGGGTGGTGATAGGT; P2, CTTCCACAACGGCAAGAAGTCC; and P3, CCACAGATACCCAGATGAATGTG. Male α5DGKO and littermate F/F (Cre) offspring were used in experiments. Mice lacking the GABAAR α2 subunit in the DG (α2DGKO) were obtained by crossing the Gabra2 floxed allele (Gabra2tm2.1Uru; Witschi et al., 2011) with the POMC–Cre transgene, whereas mice lacking the GABAAR α5 subunit in CA3 (α5CA3KO) were generated by crossing the Gabra5 floxed allele with the KA-1 Cre transgene (Nakazawa et al., 2002). Mice were bred at the animal facility at McLean Hospital. Procedures were approved by the Institutional Animal Care and Use Committees at McLean Hospital and University of Wisconsin. All procedures were in compliance with the National Institutes of Health Guide for Care and Use of Laboratory Animals (eighth edition). Mice were maintained in a 12 h light/dark cycle (lights on at 7:00 A.M., except for the plus maze, open-field, and forced swim test experiments in which animals were tested during the dark period and were maintained at lights on at 7:00 P.M.). Mice were used for only a single behavioral experiment, except for elevated plus maze, open-field, and forced swim test, which were conducted in the same cohort with a 1 week hiatus after each test. Food and water were available ad libitum for all animals. The presence/abundance of α5-GABAARs was analyzed using [3H]l-655,708 (83 Ci/mmol; GE Healthcare) binding to unfixed parasagittal cryostat-cut sections (12 μm) of brains derived from F/F, α5DGKO, and α5 global KO mice (n = 5–6 per group). Sections were washed for 15 min at 4°C in 50 mm Tris-HCl, pH 7.4, and incubated for 90 min at 4°C with 50 mm Tris-HCl, pH 7.4, containing 4 nm [3H]l-655,708 and 5 μm zolpidem. Nonspecific [3H]l-655,708 binding was determined in the presence of 10 μm flumazenil. Unbound [3H]l-655,708 was removed by washing the sections three times for 20 s in ice-cold buffer. The sections were air-dried and exposed to a tritium-sensitive phosphor screen (Packard Cyclone Storage Phosphor System) for 8 d. The screens were scanned with a Packard Cyclone Scanner, and bound radioactivity was quantified using tritium standards (Microscale; GE Healthcare) exposed in parallel. F/F, α5DGKO, and α5 global KO mice (n = 5 per group) were killed through cervical dislocation, and samples from the DG, the rest of the hippocampus, and the prefrontal cortex were taken in ice-cold PBS and were frozen immediately with dry ice. Samples were homogenized in 20 mm Tris-HCl, pH 7.4, 1% SDS buffer containing protease (protease inhibitor cocktail; Sigma-Aldrich) and phosphatase (phosphatase inhibitor cocktail 2; Sigma-Aldrich) inhibitors. Protein concentration in each sample was determined by BCA assay (Thermo Fisher Scientific), and 25 μg of protein for each sample was separated by 12% SDS-PAGE. The membranes were blocked with 5% nonfat dry milk and were incubated in primary antibodies raised in rabbit for each of the five GABAAR subtypes expressed in the hippocampus and prefrontal cortex (PhosphoSolutions) overnight at 4°C. After washes and secondary antibody (HRP-linked donkey anti-rabbit; GE Healthcare) incubation, the membranes were stripped and were blocked and reincubated in an anti-β-actin primary antibody (mouse monoclonal; Sigma-Aldrich) overnight at 4°C, followed by washes and secondary antibody (HRP-linked rabbit anti-mouse; Abcam) incubation. The blots were imaged using a chemiluminescence substrate (SuperSignal West Dura; Thermo Fisher Scientific), and the results were analyzed using NIH ImageJ software. All samples were normalized to β-actin, and the expression in F/F controls was set to 100% to indicate change from control levels in α5DGKO and global α5 KO mice. For α5-GABAAR and α2-GABAAR staining, the mice were anesthetized deeply with sodium pentobarbital (200 mg/kg) and perfused transcardially with ice-cold artificial CSF (aCSF). The brains were removed rapidly, and a block containing the hippocampus was cut and postfixed in 4% paraformaldehyde for 2 h. After postfixation, the brain blocks were placed in cryoprotectant (30% sucrose) and sectioned into 40-μm-thick sections at least 24 h later. All sections were placed in antifreeze solution and kept at −20°C until staining. The sections were washed thoroughly in PBS, pH 7.4, to remove any antifreeze solution before incubation in a primary antibody (guinea pig anti-α5, 1:3000; generously provided by Dr. Jean-Marc Fritschy, University of Zurich, Zurich, Switzerland; Fritschy and Mohler, 1995) solution containing 2% normal goat serum (NGS) and 0.2% Triton X-100 at 4°C overnight. After washes in PBS, the sections were incubated in goat anti-guinea pig Cy3 secondary antibody (1:300; Abcam) for 30 min at room temperature and washed again thoroughly. Stained sections were mounted on gelatin-coated slides and coverslipped with ProLong Gold antifade reagent with 4′,6-diamidino-2-phenylindole (DAPI) (Life Technologies). The images were obtained using a Leica confocal microscopy system at 40× magnification. For c-Fos staining, F/F and α5DGKO mice (n = 6 per group) were exposed to a novel environment (39 × 24 cm box with grid floor) for 10 min and then placed into a clean cage individually for 1 h before being anesthetized deeply with sodium pentobarbital for perfusion. The mice were perfused with ice-cold PBS, followed by 150 mm sodium phosphate buffer containing 4% paraformaldehyde and 15% picric acid. The brains were removed rapidly and placed in the same fixation solution for 4 h. The brains were cryoprotected, sectioned, and stored as above. After 30 min incubation in 0.3% H2O2, the sections were blocked in a 3% NGS and 0.25% Triton X-100 solution for at least 2 h before overnight incubation in primary antibody [rabbit anti-c-Fos (Calbiochem); 1:12,000 in 0.1% sodium azide and 0.25% Triton X-100 in PBS] at room temperature. After rinsing in PBS, the sections were incubated in biotinylated goat anti-rabbit secondary antibody in blocking solution (1:600) and were treated with the detection reagent (horseradish peroxidase avidin–biotin complex; Vecstatin Elite ABC kit; Vector Laboratories) for 30 min. After incubation in a 0.04% 3,3′-diaminobenzidine (DAB) solution containing 0.02% H2O2, the sections were mounted on gelatinized slides, air-dried, dehydrated, and coverslipped with Permount mounting medium (Thermo Fisher Scientific). The quantification of c-fos-expressing (c-fos+) nuclei was done through optical fractionator method (a-step: 250 μm, counting frame of 70 × 70 μm, height of 20 μm for the CA1, CA3, and DGC plus DG molecular layer; a-step: 150 μm, counting frame of 60 × 60 μm, height of 20 μm for the hilus) using StereoInvestigator software (MBF Bioscience). The volume of each structure was estimated using the Cavalieri method and c-fos+ nuclei per volume (cubic millimeters) was calculated for each genotype. The density of c-fos+ nuclei was then expressed as percentage of the corresponding F/F controls for each experiment. For the α2DGKO and α5CA3KO experiments, all mice were tested in a single cohort, and the littermate controls from the two breedings were combined into a single control group (n = 3 per group). For doublecortin (DCX) staining, the same procedures as c-Fos staining were followed using a rabbit anti-DCX antibody (1:1000; Abcam; n = 4 per group). Optical density of the staining was evaluated in the subgranular zone of all sections that includes the DG of the 1:6 series using NIH ImageJ software. 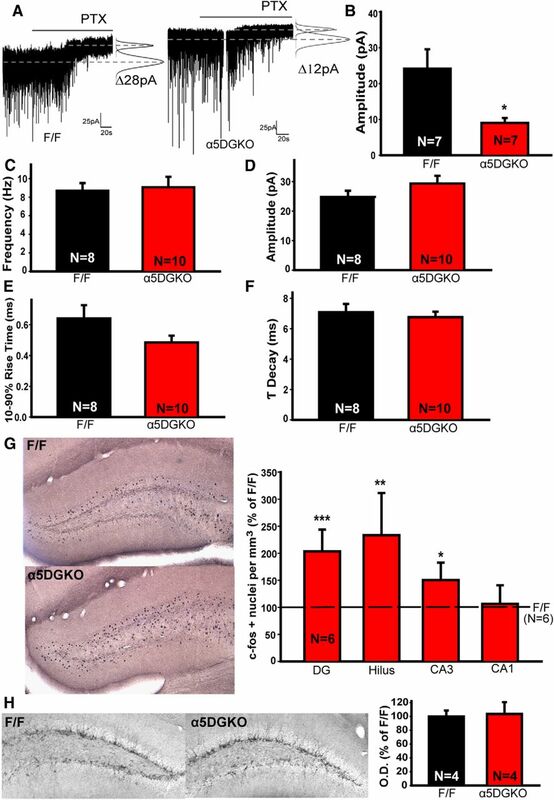 Sagittal hippocampal slices were prepared from F/F, α5-DG-KO, and α2DGKO mice (n = 4–7 mice per group) aged 50–66 d. Mice were anesthetized with 2.5–3% isoflurane and perfused with an ice-cold and oxygenated N-methyl-d-glucamine-based cutting solution. Thereafter, slices were kept in an oxygenated aCSF. Whole-cell patch-clamp recordings were performed at 30–31°C using glass pipettes filled with CsCl-based internal solution. For recordings in α5DGKO mice and littermate F/F controls (n = 7–10 cells per group), cells were held at −70 mV. Tonic and phasic inhibition were recorded in the presence of GABA (5 μm) and kynurenic acid (3 mm). Bath application of the GABAA receptor blocker picrotoxin (PTX; 100 μm) revealed tonic activity of GABAARs. Data analyses were performed using Clampfit 10.3 (Molecular Devices), Origin 9.0 (Microcal Software), GraphPad Prism 5.04 (GraphPad Software), and Mini Analysis Program 6 (Synaptosoft) software. Tonic current was calculated as the change in baseline current after adding PTX. The mean current values were obtained from Gaussian fits to all point amplitude histograms. Histograms (1 pA bin width) were constructed using 1 min of data before PTX and 20 s of data after a steady-state effect of PTX was achieved (usually 2 min). To ensure that sIPSCs were not included in the measurement of tonic inhibition, the Gaussian was fitted only using the unskewed portion of the distribution. The mean of the Gaussian fit was used as the value for the baseline tonic current. To detect sIPSCs, the search protocol threshold was set at three times the root mean square noise level, which was typically 3–6 pA. For each cell, the averaged frequency and amplitude characteristics of sIPSCs were computed automatically. For each cell, at least 40 sIPSCs were averaged, normalized, and characterized by their 10–90% rise and decay times. The sIPSCs used for averaging were selected based on the presence of a stable baseline level and the lack of spontaneous events during the deactivation phase. These events were aligned at the time of half-maximal amplitude of the rising phase. The decay phases of averaged fast sIPSCs were fitted to a monoexponential function using a Simplex fitting algorithm (Mini Analysis Program 6; Synaptosoft). The mIPSC recordings in slices from α2DGKO mice and littermate F/F controls (n = 11–12 cells per group) were done in the presence of TTX (1 μm). AMPAR-mediated synaptic events were blocked by NBQX (10 μm) in the external solution. To test our hypothesis that the α5DGKO mice would be impaired in managing interference, we conducted a number of behavioral tasks that involve encoding and retrieval of two contradictory or overlapping memories. Because any behavior can presumably be under the influence of some level of proactive and retroactive interference, what constitutes a low- versus high-interference task can be viewed only in relative terms. Most of our behavioral tests include a within-test comparison of lower- and higher-interference phases. Similarly, what constitutes better or worse management of interference can be stated also only in relative terms, in this case α5DGKO mice relative to controls. In our predictions regarding what would constitute a behavior pattern that reflects impairment in managing interference, we relied on a long line of research showing that retrieval of memories is a strongly context-dependent process (Spear, 1973; Tulving, 1974; Bouton, 1993; Millin and Riccio, 2004; Bouton et al., 2006; Yoon et al., 2011). In some computational models, this context dependency at the time of behavioral performance is encompassed by the notion of a “state” (Sutton and Barto, 1998), which is a recognition that the current situation shares certain similarities with the spatiotemporal context of the encoding of a specific memory (Redish et al., 2007). It has been argued that, in case of interfering memories, the agent chooses the “appropriate” memory to retrieve based on the current spatial (i.e., similarity between the current physical context and the physical context at the time of encoding of a specific memory) and temporal (i.e., closeness in time between a specific encoded memory and the time of retrieval) context (Bouton, 1993), also referred to as “occasion-setters.” Thus, we base our predictions for what constitutes a behavior reflective of successful or impaired management of interference on the empirically supported assumption (for a review, see Bouton, 1993) that the animal uses these contextual cues as occasion-setters for which memory to retrieve. This approach is, in our opinion, the most parsimonious, because it does not require specific predictions regarding whether proactive or retroactive interference should be sensitive to DG manipulations, and it does not require a specific assumption regarding whether the interference is taking place at the encoding or retrieval stage. Our specific predictions regarding the behavioral outcomes based on the hypothesis that the α5DGKO mice are impaired in interference management are listed below for each test. The predictions are based on the idea that the memory to be retrieved at the time of retrieval will be determined by the temporal (i.e., retrieve the memory that is closest in time) and/or physical (i.e., retrieve the memory that was encoded in the presence of physical cues that have the most similarity to the current setting) context, and interference will be represented by behavior that is in line with a memory that is not currently being signaled by the occasion-setters. A modified version of the task reported by McHugh et al. (2007) was used to test context discrimination. Mice (n = 6–14) were placed in a fear-conditioning chamber (Med-Associates; Context A: lights off, no inserts, 1% acetic acid as olfactory cue), were given a single footshock (0.4 mA) 90 s later, and were removed back to their home cage after another 90 s for the first 3 d of the experiment. The amount of freezing in the first 90 s was measured using the Video Freeze software (Med-Associates). On day 4, the mice were placed in a very different environment (Context C: lights on, floor and A-shaped ceiling insert, peppermint extract as olfactory cue) to investigate their ability to distinguish this environment. On day 5, mice were placed back in Context A and received a shock. Starting from day 6, mice were placed in one context in the morning and one in the afternoon, in random order. Context A was always associated with a shock, whereas the very similar Context B (lights off, A-shaped ceiling insert, 0.05% benzaldehyde in ethanol) was never associated with a shock. Freezing was always measured in the first 90 s. The discrimination ratio was calculated as (freezing in Context A)/(freezing in Context A + freezing in Context B). Although presented in separate graphs in Figures 3A, 4F, and 5B, the data from α5DGKO, α2DGKO, and α5CA3KO mice were collected in the same experiment, and the F/F littermates from each line were combined into a single control group because their percentage freezing scores did not differ significantly on any of the testing days. Because the order in which the mice were placed into the different contexts was randomized, temporal context in this experiment does not provide reliable occasion-setting information. Impaired pattern separation in α5DGKO mice would be reflected as increased freezing in Context B and reduced discrimination ratios compared with F/F controls. Initial context conditioning and the discrimination of the two highly disparate contexts represent low-interference conditions relative to days 6–17. The mice (n = 6–8 per group) were tested in a pool (120 cm in diameter) filled with water (22–24°C) made opaque with the addition of a white nontoxic dye (Premium Grade Tempera; Blick) containing a platform (10 cm in diameter) that was submerged by 2.5 cm under the water surface. Geometric shapes were affixed to the walls to serve as extra-maze cues. Mice were given four trials every day released from a different quadrant each time in random order, with the platform location constant. A trial ended either 10 s after the mouse climbed on the platform or 60 s after the start of the trial, with the experimenter guiding the mouse to the platform. On probe trials, the platform was removed and the mice were left in the pool for 120 s. Probe trials were followed by the normal four training trials. The intertrial interval was 1 min. During the reversal phase, the platform was moved from the original location to the nearest quadrant [rather than the 180° shift that is usually used in Morris water maze (MWM) reversal experiments] to increase the effects of interference. The mice were placed in a cage with shredded paper towels under a heat lamp until they were dry before being returned to their home cage at the end of testing. The F/F control group in Figure 3B represents Cre littermates from the α5DGKO line, whereas the F/F control group in Figures 4G and 5C is comprises combined Cre littermates from the α2DGKO and α5CA3KO lines. The data were collected in a single experiment, but the F/F control groups were not combined because the α5DGKO control group differed from the others on probe day 3. During the reversal phase, the temporal context would be in favor of retrieving the memory that is closest in time, suggesting a gradual shift from the southwest platform location to the southeast platform location. Because the physical cues remain the same in both phases of the experiment, the physical context is not expected to serve as an occasion-setter. Impaired pattern separation in α5DGKO mice would be reflected as longer latencies to the platform location, as well as more time spent in the old platform quadrant, later in the reversal phase (i.e., retrieval of the southwest platform location memory that is no longer cued by the temporal context). The initial learning of the platform location before the reversal phase represents a lower-interference condition in this experiment. Auditory fear conditioning and extinction. For the delay protocol, on the first day of the experiment, the mice (n = 8 per group) were placed in a conditioning box (Med-Associates) with grid floors and were subjected to five tone (20 s, 70 dB, 2800 Hz)–shock (2 s, 0.7 mA) pairings with 60 s intervals. At 24 h later, the mice were placed in a different context (chamber with floor and ceiling inserts and peppermint extract for olfactory cue), and, 1.5 min later, the tone was played for 6 min and freezing behavior was recorded. The delay protocol was followed by an extinction phase, in which the same procedure was repeated on days 3–8. Extinction rate was calculated by fitting a least-squares regression line to the freezing-by-day data of each mouse starting from day 3. The R2 values for the fitted regression equations were between 0.77 and 0.98, with the exception of one F/F mouse, which was excluded from the analysis because the R2 value was <0.50. The slope of these regression lines were then used as raw data for an unpaired t test comparing the extinction rates for the two genotypes. The 2 d trace conditioning protocol was the same as the first 2 d above, except the shocks were given 20 s after the termination of the tone on day 1 rather than coterminating with the tone (n = 8–9 per group). Extinction of trace fear conditioning was not tested. Similar to the reversal phase in the MWM experiment, the temporal context in the extinction phase would signal initially the memory linked with the unconditioned stimulus (CS+) and later on the memory that the conditioned stimulus is linked to safety (CS−). Because the extinction phase of the experiment takes place in a different context, the physical occasion-setting cues would favor the CS− memory after the first day of extinction training. Similar to the MWM reversal phase, based on the impaired interference-management hypothesis, α5DGKO mice would be expected to show higher freezing compared with controls in the later stages of extinction training. The initial acquisition of auditory fear conditioning represents a low-interference situation, in which interference from conflicting, ambiguous associations is expected to be relatively low. Contextual fear conditioning and extinction. On the first day of the experiment, the mice (n = 8 per group) were placed in a conditioning box (Med-Associates), and, 120 s later, were given two shocks (2 s, 1.5 mA, 30 s apart). At 24 h later, they were returned to the same context for 180 s, and freezing was recorded. For the extinction experiment, the training procedure was repeated on day 2 to achieve equal freezing for the two genotypes. The mice (n = 9–10 per group) were returned to the same chamber for 180 s, and freezing was recorded every 24 h until day 12. Although this procedure enabled us to achieve equal freezing by day 3, it should be noted that the differential learning on day 2 is still an unavoidable confound. Moreover, when the above regression procedure was applied to calculate the extinction rate, 8 of 10 α5DGKO mice had regression lines with R2 values <0.50 (only one F/F mouse had R2 < 0.50). Thus, instead of extinction rate, freezing on days 2 and 12 was compared for each genotype as a proxy measure for extinction learning. The temporal context is expected to cue a gradual shift from CS+ to CS− memories, as above, whereas the physical context cannot serve as an occasion-setter in this experiment. Thus, the predictions are similar to the auditory conditioning experiment, and the initial learning of the context–shock association similarly represents a lower-interference case. Mice (n = 7–9 per group) were assigned randomly to a “preexposure” or “no-preexposure” group on day 1. The mice in the preexposure group were placed in Context A (floor insert, white chamber light, 0.5% benzaldehyde as olfactory cue) and were presented with 30 tones (20 s, 70 dB, 2800 Hz) with 30 s intervals. The no-preexposure group were placed in the same chamber but no tone was presented. On day 2, all mice were placed in Context B (no inserts, small white stimulus light, 1% acetic acid as olfactory cue) and were fear conditioned to the tone using the delay-fear conditioning protocol introduced above. On day 3, all mice were placed in Context C (floor and ceiling inserts, lights off, 1% peppermint extract as olfactory cue), tone was presented as in the cued fear conditioning protocol, and freezing behavior was measured. On day 3, temporal cues signal the recall of the most recent memory (i.e., conditioning rather than preexposure). Because the three phases of the experiment take place in three different contexts, physical contextual cues cannot be used as occasion-setting cues. Consequently, our hypothesis would predict a small (or no) latent inhibition effect in controls, whereas pattern separation impairment in α5DGKO mice would be indicated by a larger latent inhibition effect compared with controls. The no-preexposure groups represent a lower-interference situation compared with the preexposed groups. To clarify the unexpected findings from the first experiment, a small group of naive F/F and α5DGKO mice (n = 4–8) were tested in a follow-up experiment in which all procedures were the same as above with the exception of the removal of the floor insert from Context C.
The mice (n = 11 per group) were exposed to two copies of the same object for three 15 min sessions with 15 min between trials. One hour later, they were exposed to the training object and a novel object, and interaction time was recorded. Novel object recognition was used as a low-interference task, because the test phase requires the retrieval of only a single memory (i.e., the recognition of one object as the familiar one). Thus, no impairment in α5DGKO mice is predicted based on the pattern separation hypothesis. The procedures were similar to those described by Smith et al. (2012). Mice were placed in the plus maze (open arms, 35 × 6 cm; closed arms, 35 × 6 × 20 cm; elevation, 1 m) facing one of the open arms under low-light (30 lux) conditions. The percentage of open arm time [(open arm time/5 min) × 100] and percentage of open arm entries [(open arm entries/(open arm entries + closed arm entries)) × 100] were quantified using the Noldus Ethovision XT tracking software after 5 min of testing. The procedures were similar to those described by Vollenweider et al. (2011). Mice were placed in a cylinder (diameter, 20 cm) containing water (23–24°C), and behavior was recorded for 5 min. Latency to first immobility and total time spent immobile were subsequently hand-scored from the videos. Each mouse was placed in a Plexiglas box (42 × 42 × 10 cm) under white-light (100 lux) conditions for 30 min, and the total distance traveled (centimeters) and the amount of time spent (seconds) in the 10 × 10 cm center of the box were quantified using the Noldus Ethovision XT tracking software. The DG-selective reduction in α5-GABAAR expression (Fig. 1B–E′) was confirmed through autoradiography using the α5-selective compound l-655,708 (Fig. 1F; unpaired t test for DG, t(9) = 7.71, p < 0.001) and Western blot (Fig. 1G; one-way ANOVA for DG, F(2,12) = 46.87, p < 0.001; Holm–Sidak post hoc test for DG F/F, t(9) = 8.82, p < 0.001). No change was detected in the expression of the α5-GABAARs in the CA1, CA3, or prefrontal cortex (Fig. 1F,G). Figure 1B–G shows that the estimates of the level of knockdown in DG change depending on the quantification method used; Western blot indicates an 80% reduction, whereas the autoradiography ligand-binding assay shows a more modest ∼60% reduction in α5 expression in DG. One reason for this discrepancy may be that only fully assembled α5-GABAARs are detected through [3H]l-655,708 binding, whereas the antibodies used in the Western blot and immunohistochemistry assays directly target the α5 subunit. Because receptor assembly processes are inefficient and the subunits are usually synthesized in excess, it is possible that the remaining 20% of α5 subunits are sufficient for the assembly of 40% α5-GABAARs. However, we cannot exclude the possibility that other technical reasons, such as the relative sensitivity of different assays, could be at least partially responsible for this discrepancy. Importantly, regardless of the exact level of the knockdown indicated by different assays, all assays show a DG-specific reduction in the expression of α5-GABAARs without changes in other hippocampal and cortical areas. Additionally, the expression of other GABAARs was also not affected (Table 1), confirming an anatomically and molecularly selective reduction in α5-GABAAR expression in DG. A, Generation of α5DGKO mice. P1–P3, PCR primers (loxP sites and primers not drawn to scale). B, False color image of DAB staining for α5-GABAARs in F/F and α5DGKO mice. Cool colors represent denser staining. C–E, Immunofluorescence staining of coronal sections from an F/F mouse showing DAPI counterstain (C), α5 antibody (D), and merged image (E). C′–E′, Same as C–E for α5DGKO. F, Top, Autoradiographs showing the distribution of [3H]l-655,708 binding sites in the hippocampi of F/F control, α5DGKO, and α5 global KO mice. Bottom, Density of [3H]l-655,708 binding sites (nanocuries per milligrams) in F/F and α5DGKO mice. G, Densitometric analysis of the Western blot membranes from F/F, α5 global KO, and α5DGKO mice. DGml, DG molecular layer. **p < 0.01, ***p < 0.001 compared with the corresponding F/F group. As expected based on previous studies showing the role of α5-GABAARs in tonic inhibition in other hippocampal areas (Caraiscos et al., 2004), α5DGKO mice had reduced amplitude of tonic currents in DGCs compared with F/F control mice (unpaired t test, t(12) = 2.79, p = 0.02; Fig. 2A,B). Conversely, fast phasic inhibition was not affected (frequency, t(16) = 0.26, p = 0.80; amplitude, t(16) = 1.32, p = 0.21; rise time, t(16) = 1.72, p = 0.11; decay constant, t(16) = 0.51, p = 0.62; Fig. 2C–F), making it possible to test the hypothesis that tonic inhibitory control of the DGCs is necessary for sparse activation patterns and, consecutively, pattern separation. A, Tonic inhibition in slices from F/F (left) and α5DGKO (right) mice perfused with PTX. B, Tonic current amplitude in F/F and α5DGKO mice. Frequency (C), amplitude (D), 10–90% rise time (E), and tau decay time (F) of sIPSCs in F/F and α5DGKO mice. G, Left, Representative sections showing c-fos expression in F/F and α5DGKO mice. Right, Estimated density of c-fos+ nuclei in α5DGKO mice expressed as percentage of F/F controls. H, Left, Representative sections showing DCX staining in F/F and α5DGKO mice. Right, Optical density in the subgranular zone of DCX-stained sections from F/F and α5DGKO mice. *p < 0.05, **p < 0.01, ***p < 0.001 compared with the corresponding F/F group. The expression of the immediate early gene c-fos during novelty exposure was used as a proxy for the sparseness of DG activation. α5DGKO mice had an increase in the density of c-fos+ cells in the DG compared with controls (Fig. 2G; unpaired t test, t(10) = 5.90, p < 0.001). An increase in the density of c-fos+ cells compared with F/F was also observed in the hilus (unpaired t test, t(10) = 3.26, p = 0.01) and downstream in the CA3 (unpaired t test, t(10) = 2.58, p = 0.03) but not in CA1 (t(10) = 0.26, p = 0.80). Because DG neurogenesis has been shown to affect pattern separation (Sahay et al., 2011; Burghardt et al., 2012), we evaluated possible changes in neurogenesis in α5DGKO mice through DCX staining and the subsequent semiquantitative analysis of staining density in the subgranular zone through the comparison of optical density in stained slices. Sections from α5DGKO mice were comparable with control sections in terms of DCX staining intensity in the subgranular zone (t(6) = 0.18, p = 0.86; Fig. 2H). α5DGKO mice showed enhanced fear conditioning to context (Fig. 3A, top, days 2 and 3) and no impairment in distinguishing a highly different context (Context C) from Context A (days 2, 3, and 5 compared with day 4; two-way ANOVA for day and genotype; main effect of day, F(4,96) = 236.20, p < 0.001; main effect of genotype, F(1,96) = 4.42, p = 0.05; day × genotype interaction, F(4,96) = 1.14, p = 0.34; Holm–Sidak post hoc tests showed that α5DGKO mice showed higher freezing than F/F controls on day 2, t(24) = 2.13, p = 0.03). Conversely, α5DGKO mice had a deficiency in discriminating between two highly similar contexts (Fig. 3A, bottom; two-way ANOVA for day and genotype, main effect of day, F(11,264) = 2.46, p = 0.01; main effect of genotype, F(1,264) = 8.57, p = 0.01; day × genotype interaction, F(11,264) = 1.13, p = 0.34). The lower discrimination ratio of α5DGKO mice was attributable to increased freezing to Context B rather than reduced freezing to Context A (Fig. 3A, middle). The findings are in line with the prediction that α5DGKO mice would show impairments in managing interference. Moreover, there was no evidence of an impairment when interference was lower (i.e., the highly different Context C vs Context A). A, Context discrimination in F/F and α5DGKO mice. Top, Days 1–3 and 5, Freezing before the shock on training trials; Day 4, freezing to a dissimilar context. Middle, Freezing to highly similar Contexts A and B in F/F and α5DGKO mice. Bottom, Discrimination ratio between the fear-conditioned Context A and similar safe Context B. B, MWM in F/F and α5DGKO mice. Top, Latency to platform location. Bottom, Percentage time spent in the quadrant housing the initial platform location. C, Cued fear conditioning in F/F and α5DGKO mice. Top, Percentage time spent freezing during the tone 24 h after trace or delay fear conditioning. Middle, Percentage time spent freezing during the tone during extinction of delay fear conditioning. Bottom, Slope of the least squares regression lines fitted into the percentage tone-related freezing data of each mouse (i.e., extinction rate). D, Contextual fear conditioning in F/F and α5DGKO mice. Top, Percentage time spent freezing to the context 24 h after conditioning. Middle, Daily freezing after 2 d of training. Bottom, Comparison of day 2 and day 12 context freezing for each genotype. E, Latent inhibition to the conditioned cue in F/F and α5DGKO mice. Percentage time spent freezing during the tone in mice that were preexposed to the tone versus non-preexposed mice. Bar graphs on the left represent the results of Experiment 1, in which the testing context was similar to the preexposure context. Bar graphs on the right represent the results of Experiment 2, in which the testing context was similar to the conditioning context. F, Novel object recognition in F/F and α5DGKO mice. Percentage of time spent interacting with the novel object out of total object interaction time. *p < 0.05, **p < 0.01, ***p < 0.001. In MWM, α5DGKO mice successfully acquired the platform location during the initial training phase (Fig. 3B; probe days 3, 6, and 9). During reversal, when interference is presumably high because of previous learning of a different platform location (probe days 11, 13, and 15), α5DGKO mice took longer to find the new platform location (mixed two-way ANOVA; day, F(5,70) = 4.44, p < 0.001; genotype, F(1,70) = 1.63, p = 0.22; day × genotype, F(5,70) = 2.41, p = 0.05; Holm–Sidak post hoc test, t(14) = 2.05, p < 0.05 for day 11; t(14) = 3.08, p < 0.01 for day 15; Fig. 3B, top) and spent more time in the old platform quadrant (mixed two-way ANOVA; day, F(5,70) = 6.32, p < 0.001; genotype, F(1,70) = 0.60, p = 0.45; day × genotype, F(5,70) = 2.42, p = 0.04; Holm–Sidak post hoc test, day 13, t(14) = −3.34, p = 0.01; day 15, t(14) = 2.61, p = 0.02; Fig. 3B, bottom). Thus, performance in the MWM training and reversal phases indicates intact acquisition of spatial memory but impaired performance under high-interference conditions. α5DGKO mice were comparable with controls in acquisition of delay fear conditioning (Fig. 3C, top), in line with previous reports indicating that cued fear conditioning is not dependent on hippocampal function when the training is conducted using a delay protocol (McEchron et al., 1998). Despite the hippocampus-independent nature of the initial learning of delay fear conditioning, α5DGKO mice were found to be impaired in extinction learning [Fig. 3C, bottom two graphs; unpaired t test on slopes (i.e., “extinction rate”), t(14) = 2.97, p = 0.01]. α5DGKO mice were also comparable with F/F controls in acquisition of fear conditioning to auditory cue when a trace protocol was used (Fig. 3C, top). Previous studies have shown that the reduction of tonic inhibition through global manipulations can enhance trace fear conditioning (Collinson et al., 2002; Crestani et al., 2002; Yee et al., 2004; Wiltgen et al., 2005; Moore et al., 2010). The lack of such an enhancement in α5DGKO mice could be indicative of a different anatomical substrate for the enhanced trace fear conditioning effect (e.g., CA1; Rogers et al., 2006), or the relatively small (∼50%) reduction in DG tonic inhibition in α5DGKO mice may be insufficient to enhance trace fear conditioning. The overall findings of the cued fear conditioning and extinction experiments are in line with the prediction that α5DGKO mice show impaired performance under high-interference (i.e., extinction training) but not low-interference (i.e., initial learning) conditions. α5DGKO mice showed improved contextual fear conditioning (unpaired t test, t(14) = −4.85, p < 0.001; Fig. 3D, top; for similar effects after reduction of tonic inhibition, see Wiltgen et al., 2005; Moore et al., 2010) when tested 24 h after training, confirming the findings from the first phase of context discrimination training. When the training sessions were repeated every 24 h, the difference between the genotypes was already absent by day 3 (Fig. 3D, middle graph; unpaired t test, t(17) = 0.65, p = 0.53). α5DGKO mice showed reduced extinction memory compared with controls, as indicated by the differences in percentage freezing scores on the later days of extinction training, as well as by the comparisons between day 2 and day 12 freezing scores. Although F/F mice have significantly lower percentage freezing scores on day 12 compared with day 2 of training (paired t test, t(8) = 3.32, p = 0.01), α5DGKO mice showed equal freezing on days 2 and 12 (paired t test, t(9) = 0.04, p = 0.97). Impaired extinction learning of context conditioning in α5DGKO mice is in line with the hypothesis that the α5DGKO mice are impaired in pattern separation. However, as noted above, the extinction data should be interpreted cautiously because of the initial difference in conditioning. In Experiment 1, F/F control mice showed lower freezing if they had been preexposed to the stimulus before fear conditioning (i.e., latent inhibition effect), whereas α5DGKO mice responded similarly to the stimulus regardless of preexposure condition. (Fig. 3E, left; two-way ANOVA, genotype, F(1,27) = 0.82, p = 0.37; preexposure condition, F(1,27) = 11.34, p = 0.002; genotype × preexposure condition interaction, F(1,27) = 6.87, p = 0.01; Holm–Sidak within F/F, t(15) = 4.45, p < 0.001; within α5DGKO, t(12) = 0.51, p = 0.62). This finding is in direct conflict with the outcomes that would be predicted by intact pattern separation in control mice and impaired pattern separation in α5DGKO mice. It is also in conflict with previous findings that, in intact control animals, the latent inhibition effect occurs only when the preexposure and testing phases take place in the same context (Holt and Maren, 1999; Westbrook et al., 2000; in which case, the physical cues would indicate that the preexposure CS–no-unconditioned stimulus (US) memory should be recalled). One possibility is that the high similarity between the preexposure and testing conditions could have worked as an occasion-setter for the preexposure memory (see Discussion). To test this hypothesis, we conducted a second experiment with the testing context changed minimally to resemble the training rather than the preexposure context through the removal of the floor insert. Indeed, under these circumstances, the latent inhibition effect was abolished in control mice (Fig. 3E, right; mixed two-way ANOVA, genotype, F(1,20) = 3.85, p = 0.06; preexposure condition, F(1,20) = 0.28, p = 0.60; genotype × preexposure condition, F(1,20) = 0.04, p = 0.84). The lack of a latent inhibition effect in this version of the test cannot be attributed to the summative effect of conditioning to the auditory and contextual cues, because contextual freezing on the testing day did not differ between different preexposure conditions (data not shown; mixed two-way ANOVA, genotype, F(1,20) = 5.2, p = 0.34; preexposure condition, F(1,20) = 0.11, p = 0.74; genotype × preexposure condition, F(1,20) = 0.51, p = 0.48; Holm–Sidak post hoc tests, α5DGKO mice had overall higher freezing than controls, regardless of preexposure condition, t(22) = 2.28, p = 0.03). This finding lends credence to the idea that the contextual cues were signing for conditions that were the same as the preexposure conditions in the first experiment above, in which case, the lack of a latent inhibition effect in α5DGKO mice would be in line with the predictions of impaired pattern separation. However, behavior of the α5DGKO mice was similar to controls in the second experiment, which does not indicate a pattern separation deficiency. α5DGKO mice were comparable with controls in object recognition memory, as measured by the proportion of time spent with a novel object out of total object interaction time on the testing day (Fig. 3F; unpaired t test, t(20) = 0.58, p = 0.57). Measures of anxiety, behavioral despair, and general locomotion were taken, because differences in these variables can potentially confound findings in other tests, such as freezing behavior or swimming to the platform in MWM. α5DGKO mice were comparable with controls in terms of open arm time in the elevated plus maze, a reverse measure of anxiety-like behavior; in terms of immobility in the forced swim test, a measure of behavioral despair, and in terms of general locomotion, as measured by the total distance traveled in an open field (Table 2). To assess whether pattern separation depended specifically on tonic inhibitory control of DGCs, we generated a DGC-selective KO of synaptic α2-GABAARs (α2DGKO; Fig. 4A). Amplitude of mIPSCs was reduced significantly in α2DGKO mice compared with F/F controls (unpaired t test, t(21) = 2.12, p = 0.04), with a minor effect on frequency (t(21) = 1.82, p = 0.08), and no effect on decay time (Fig. 4B–E), suggesting a modest change in phasic inhibition in DGCs. In α2DGKO mice, the increase in c-fos expression in response to novelty was limited to the hilar region of the DG (t(4) = 3.05, p = 0.04), with no significant changes in DGCs, CA3, and CA1 (Table 3). Unlike α5DGKO mice, α2DGKO mice were comparable with controls in context discrimination (Fig. 4F; two-way mixed ANOVA, genotype, F(1,198) = 0.01, p = 0.96; day, F(11,198) = 1.32, p = 0.21; day × genotype, F(11,198) = 0.90, p = 0.54). α2DGKO mice showed faster learning in the initial MWM training phase and had no deficits in MWM reversal; in fact, α2DGKO mice were better than controls on the first probe day of the reversal phase (Fig. 4G; two-way mixed ANOVA, genotype, F(1,70) = 27.99, p < 0.001; day, F(5,70) = 5.38, p < 0.001; day × genotype, F(5,70) = 2.24, p = 0.06; Holm–Sidak post hoc tests significant on days 3, 6, and 11, p < 0.05). α2DGKO mice were also similar to controls in latent inhibition (Fig. 4H; two-way ANOVA, preexposure condition, F(1,20) = 23.33, p < 0.001; genotype, F(1,20) = 2.08, p = 0.17; preexposure condition × genotype, F(1,20) = 1.08, p = 0.31). A, False color image of DAB staining for α2-GABAARs in F/F and α2DGKO mice. Cool colors represent denser staining. B, Representative traces recorded from slices from F/F control (top) and α2DGKO (bottom) mice. Frequency (C), amplitude (D), and decay time (E) of mIPSCs recorded in slices from F/F and α2DGKO mice. F, Context discrimination in F/F and α2DGKO mice. G, MWM in F/F and α2DGKO mice. H, Latent inhibition in F/F and α2DGKO mice. *p < 0.05, **p < 0.01, #p < 0.08. Thus, the reduction of fast phasic inhibition in the DG through a DGC-selective reduction in α2-GABAAR expression does not lead to the same phenotype in high-interference cognitive tasks as the reduction of tonic inhibition through DGC-selective reduction in α5-GABAAR expression. Because DG output is laid almost exclusively onto CA3 and our c-fos studies revealed an increase in the density of c-fos+ nuclei in the CA3 of α5DGKO mice, we next tested whether the KO of α5-GABAARs directly downstream in the CA3 (i.e., α5CA3KO; Fig. 5A) would lead to the same phenotype. α5CA3KO mice showed increased activation in CA3 in response to exposure to a novel environment compared with F/F controls (t(4) = 3.07, p = 0.04), as measured by c-fos+ cell density, with no change in the DG or CA1 regions (Table 3). 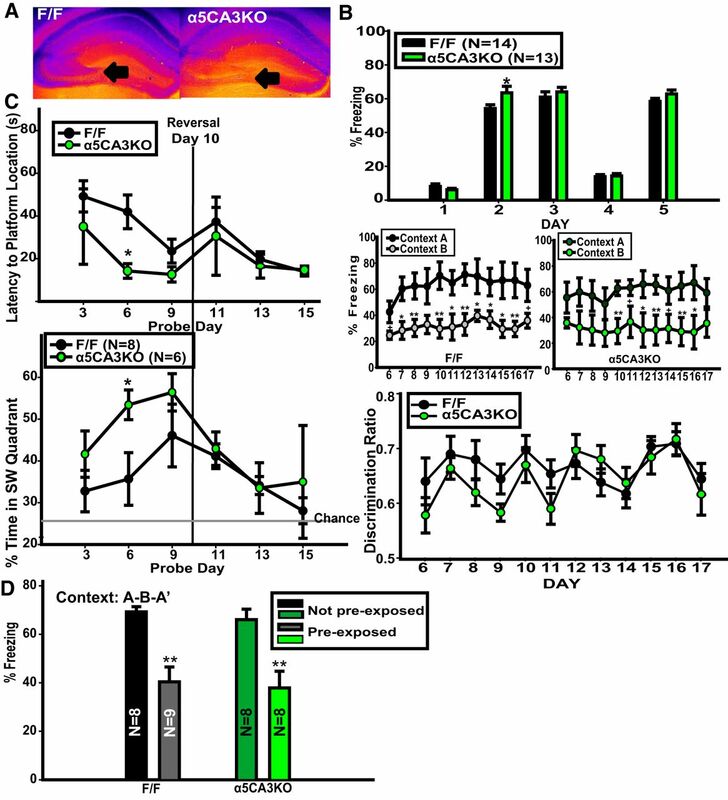 α5CA3KO mice showed enhanced context fear conditioning as measured by freezing to Context A on day 2 of the context discrimination experiment (t(27) = 2.13, p = 0.04; Fig. 5B, top). However, α5CA3KO mice were comparable with controls in the context discrimination phase of this experiment (Fig. 5B, middle and bottom; two-way mixed ANOVA, genotype, F(1,270) = 0.55, p = 0.47; day, F(11,270) = 3.97, p = 0.002; day × genotype, F(11,270) = 1.32, p = 0.21), as well as in MWM reversal (Fig. 5C; two-way mixed ANOVA, genotype, F(1,60) = 4.90, p = 0.05; day, F(5,60) = 3.51, p = 0.01; day × genotype, F(5,60) = 0.76, p = 0.59; probe day 6, Holm–Sidak post hoc test, t(12) = 2.40, p = 0.02) and latent inhibition (Fig. 5D; two-way ANOVA, preexposure condition, F(1,29) = 0.29, p = 0.59; genotype, F(1,29) = 29.09, p < 0.001; preexposure × genotype, F(1,29) = 0.004, p = 0.95). A, False color image of DAB staining for α5-GABAARs in F/F and α5CA3KO mice. Cool colors represent denser staining. B, Context discrimination in F/F and α5CA3KO mice. C, MWM in F/F and α5CA3KO mice. D, Latent inhibition in F/F and α5CA3KO mice. *p < 0.05, **p < 0.01. Thus, the CA3-selective KO of α5-GABAARs and the resulting increase in activity in this region as measured by the number of c-fos+ nuclei was not sufficient to cause a phenotype in high-interference cognitive tasks. Accurate encoding and retrieval of declarative memories under conditions of high interference is one of the major functions of the hippocampus. Here, we tested the mechanistic hypothesis that sparse DG activation maintained by tonic inhibition is required for the ability to manage interference through pattern separation. To reduce tonic inhibition in the DG, we generated Gabra5-floxed mice (F/F) and crossed these mice with POMC Cre transgenic mice to achieve the DGC-selective KO of the α5-GABAARs (α5DGKO). Although Cre expression in the POMC Cre transgenic mouse line is also observed in other structures, such as the hypothalamus, significant recombination was observed only in the DGCs in previous studies (McHugh et al., 2007). Indeed, we did not observe changes in the expression of the GABAAR α5 subunit in other areas that were linked previously to memory interference, such as the rest of the hippocampus and the prefrontal cortex (Wan et al., 1994; Martínez et al., 2014). The DGC-selective KO of α5-GABAARs reduced tonic currents without affecting fast phasic inhibition. The reduction in tonic currents doubled the activation rate of DGCs (i.e., reduced sparseness). According to computational models, reducing tonic inhibitory control over DGCs and the resulting disruption of sparse activation patterns should lead to interference between overlapping memories (O'Reilly and McClelland, 1994; Rolls and Kesner, 2006; Aimone et al., 2011; Kesner and Rolls, 2015). Thus, we tested mice under conditions in which memory interference is presumably lower, such as discriminative conditioning to two highly different contexts, initial learning of the platform location in MWM, acquisition of cued or contextual fear conditioning, or object recognition memory, and under conditions of presumably high memory interference, such as discrimination between two highly similar contexts, reversal learning in MWM, extinction learning in fear conditioning, or latent inhibition. A number of important questions regarding the behavioral data should be addressed. The first question concerns the concept of pattern separation. Pattern separation reduces interference and ensures that overlapping memories are not recalled while retrieving a specific memory (McClelland et al., 1995). As a computational concept, pattern separation is an orthogonalization process in which highly similar, overlapping inputs are converted into nonoverlapping, distinct outputs. As such, a direct test of the role of DG tonic inhibition/sparseness of DG activation in pattern separation would require a test of the degree of overlap in entorhinal inputs to the DG versus the degree of overlap in the DG outputs to CA3. Thus, the above tests do not comprise direct tests of the computational concept of pattern separation, and it has been disputed whether it is at all possible to have a direct behavioral test of this concept (see discussions by Aimone et al., 2011; Santoro, 2013). The findings can merely be consistent with, in conflict with, or null in regards to the predictions of the pattern separation hypothesis. The second question relates to what the specific predictions would be when pattern separation is intact or compromised. We propose that the adaptive management of interference would be reflected in behaviors that are appropriate for the current physical and temporal context as opposed to reactions that reflect similar, overlapping memories. As such, our findings from the context discrimination, MWM reversal, and extinction learning experiments are consistent with the hypothesis of impaired pattern separation in α5DGKO mice. Conversely, in the latent inhibition experiment, our initial findings were difficult to interpret, because the behavior of control mice were in conflict with findings of previous studies showing the context specificity of the latent inhibition effect (Holt and Maren, 1999; Westbrook et al., 2000). Experience from our contextual conditioning experiments (Fig. 3A, top; McHugh et al., 2007) suggests that the floor insert has the largest effect as a contextual cue. Thus, we hypothesized that the high similarity between the preexposure and test contexts could have led the test context to serve as an occasion-setter for the preexposure memory (i.e., contexts perceived as A-B-A′ instead of A-B-C). To test this hypothesis, we conducted a small follow-up experiment, keeping all procedures the same, with the exception of removing the floor insert on day 3 (i.e., increasing the similarity between the test context and the conditioning context; A-B-B′). This manipulation indeed abolished the latent inhibition effect in F/F mice, lending credence to the above interpretation. When viewed in the light of this finding, the lack of a latent inhibition effect in α5DGKO mice in the first latent inhibition experiment would be consistent with an impairment in interference management compared with controls, because the high level of freezing indicates the retrieval of the competing US–CS+ memory rather than the US–CS− memory that is signaled by the occasion-setting cues. In contrast, in the second experiment (Fig. 3E, right), α5DGKO mice behave similarly to controls, showing no evidence of an interference effect based on occasion-setting cues. Thus, α5DGKO mice seem to retrieve the more recent, CS+ memory regardless of the contextual cues, suggesting additional experiments taking into account that variables, such as the extent of context dependence of different memories (Bouton, 1993; Nelson, 2002), may be required to clarify the results of this specific experiment. A third question relates to our findings that extinction and latent inhibition of delay fear conditioning seem to depend on the functional integrity of the DG, although the acquisition of delay fear conditioning per se is hippocampus independent (Selden et al., 1991). These findings may indicate that the encoding/retrieval of a memory under low-interference versus high-interference conditions may involve different brain regions. Indeed, there is some evidence that the hippocampus may be involved in extinction and latent inhibition, even when the initial learning of the memory is hippocampus independent (Reilly et al., 1993; cf. Honey and Good, 1993; Purves et al., 1995; Yee et al., 2004; Corcoran et al., 2005; Milad et al., 2007; Gerdjikov et al., 2008). Similarly, NMDAR-mediated synaptic plasticity in the DG and CA1 has been shown to be not required for associative spatial learning but involved in the resolution of interference between different spatial memories (Bannerman et al., 2012). Our findings suggest that the involvement of the DG in interference management may be relatively domain independent, extending to domains usually considered nonhippocampal (cf. Swan et al., 2014). Although alternative explanations may be possible for the findings of individual experiments (e.g., differences in attention to the CS and associability of CS with US in latent inhibition; Lubow et al., 1981), we believe that, for the overall pattern of results combined together, the most parsimonious interpretation is that, as predicted by computational models (Kesner and Rolls, 2015), increasing overall excitability of the DG through reducing tonic inhibition (Mody and Pearce, 2004; Farrant and Nusser, 2005) results in behavioral deficits consistent with impaired pattern separation. 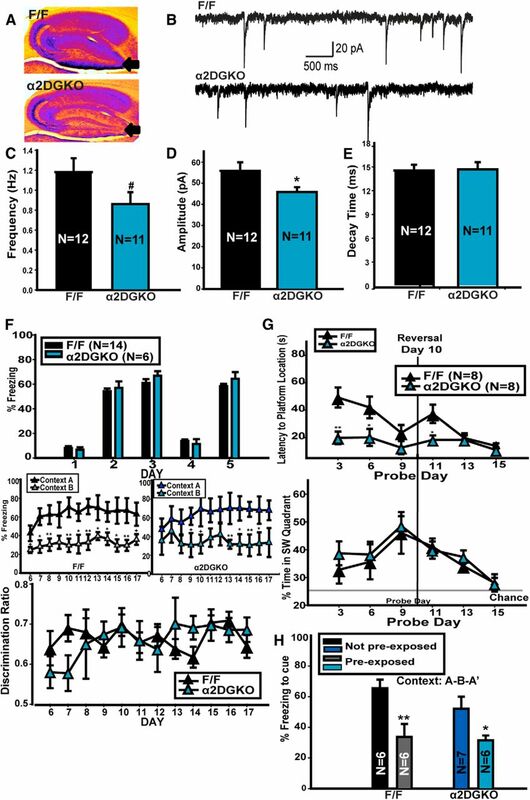 These findings cannot be attributed to nonspecific differences in locomotor activity, anxiety levels, despair-like behavior, or adult neurogenesis, because α5DGKO mice were comparable with F/F in respective control experiments. Increasing/decreasing the overall excitability of the DG through other manipulations has also been shown to impair/improve pattern separation (Sahay et al., 2011; Nakashiba et al., 2012; Ikrar et al., 2013), suggesting that the excitability of the DG may be a key factor in the successful management of interference. The specificity of this result to tonic inhibition and overall excitability is emphasized by our finding that reducing dynamic, transient inhibitory control in DG through fast phasic inhibition (i.e., α2DGKO) did not lead to deficits in high-interference tasks. Moreover, although computational models have emphasized the importance of a relatively fixed threshold on the firing of DGCs with the overall effect of maintaining sparseness in the recurrent collateral network of CA3 (O'Reilly and McClelland, 1994), increasing neuronal activity directly in the CA3 using a CA3-selective KO of α5-GABAARs did not impair performance in high-interference tasks. Thus, the mediation of pattern separation by the DG–CA3 network can be disrupted via a reduction of tonic inhibition in DG but not via a similar manipulation directly in CA3. Overall, our findings indicate that α5-GABAAR-mediated tonic inhibition in the DG plays an important role in ensuring normal cognitive functioning under high-interference memory conditions. It has been reported that α5-GABAAR expression is reduced in the hippocampi and prefrontal cortex of patients with autism spectrum disorders (Fatemi et al., 2010; Mendez et al., 2013). There is also evidence that α5-GABAAR expression may be reduced in the forebrain of patients with schizophrenia, that this reduction may correlate with symptom severity (Asai et al., 2008; Duncan et al., 2010), and that positive modulation of α5-GABAARs may normalize hippocampal activity and alleviate cognitive symptoms in schizophrenia (Gill et al., 2011; Gill and Grace, 2014). Although preliminary, combined with these previous reports, our findings make a case for the possibility that α5-selective GABAAR-positive allosteric modulators (Fischer et al., 2010; Gill et al., 2011) could present an attractive therapeutic route for ameliorating interference-related cognitive symptoms in some psychiatric disorders. This research was supported by National Institute of General Medical Sciences/National Institutes of Health (NIH) Grant R01GM086448 (U.R. ), National Institute of Mental Health/NIH Grant R01MH080006 (U.R. ), an Eleanor and Miles Shore Harvard Medical School Fellowship (E.E. ), an Andrew P. Merrill Memorial Research Fellowship (E.E. ), National Alliance for Research on Schizophrenia and Depression Young Investigator Award (E.E.). The Leica TCS-SP8 confocal microscope used in this study was purchased with funding from NIH SIG Grant 1S10OD010737-01A1. We thank Konstantin Bakhurin, Nishani Hewage, and Rachel Foster (McLean Hospital) for assistance in genotyping, Horst Bluethmann (formerly Roche, Basel, Switzerland) for help in the generation of the α5 floxed mice, Birgit Ledermann (formerly University of Zurich, Zurich, Switzerland) for help in the generation of the α5 global knock-out mice, Dr. Jean-Marc Fritschy for providing the GABAA receptor antibodies and for his valuable advice on immunohistochemistry, Dr. Bradford Lowell (Beth Israel Deaconess Medical Center, Boston, MA) for providing POMC–Cre mice, and Dr. Benjamin K. Yee for critical reading of this manuscript. The α5 floxed mice and the α2 floxed mice were provided to McLean Hospital by the University of Zurich. U.R. has received compensation for professional services from Concert Pharmaceuticals. The other authors declare no competing financial interests. (2008) GABA(A)/Benzodiazepine receptor binding in patients with schizophrenia using [C-11]Ro15–4513, a radioligand with relatively high affinity for alpha 5 subunit. Schizophr Res 99:333–340, doi:10.1016/j.schres.2007.10.014, pmid:18042347. (2012) Dissecting spatial knowledge from spatial choice by hippocampal NMDA receptor deletion. Nat Neurosci 15:1153–1159, doi:10.1038/nn.3166, pmid:22797694. (1996) Intact and impaired memory functions in autism. Child Dev 67:1816–1835, doi:10.2307/1131734, pmid:8890510. (1993) Context, time and memory retrieval in the interference paradigms of Pavlovian learning. Psychol Bull 114:80–99, doi:10.1037/0033-2909.114.1.80, pmid:8346330. (2010) Multiple list learning in adults with autism spectrum disorder: parallels with frontal lobe damage or further evidence of diminished relational processing? J Autism Dev Disord 40:179–187, doi:10.1007/s10803-009-0845-x, pmid:19680798. (2012) Adult-born hippocampal neurons promote cognitive flexibility in mice. Hippocampus 22:1795–1808, doi:10.1002/hipo.22013, pmid:22431384. (2004) Tonic inhibition in mouse hippocampal CA1 pyramidal neurons is mediated by alpha5 subunit-containing gamma-aminobutyric acid type A receptors. Proc Natl Acad Sci USA 101:3662–3667, doi:10.1073/pnas.0307231101, pmid:14993607. (2002) Enhanced learning and memory and altered GABAergic synaptic transmission in mice lacking the alpha 5 subunit of the GABAA receptor. J Neurosci 22:5572–5580, pmid:12097508. (2005) Hippocampal inactivation disrupts the acquisition and contextual encoding of fear extinction. J Neurosci 25:8978–8987, doi:10.1523/JNEUROSCI.2246-05.2005, pmid:16192388. (2002) Trace fear conditioning involves hippocampal alpha(5) GABA(A) receptors. Proc Natl Acad Sci USA 99:8980–8985, doi:10.1073/pnas.142288699, pmid:12084936. (2014) Loss of pattern separation in schizophrenia suggests dentate gyrus dysfunction. Schizophr Res 159:193–197, doi:10.1016/j.schres.2014.05.006, pmid:25176349. (2010) Prefrontal GABA(A) receptor alpha subunit expression in normal postnatal human development and schizophrenia. J Psychiat Res 44:673–681, doi:10.1016/j.jpsychires.2009.12.007, pmid:20100621. (2010) mRNA and protein levels for GABAA alpha4, alpha5, beta1 and GABABR1 receptors are altered in brains from subjects with autism. J Autism Dev Disord 40:743–750, doi:10.1007/s10803-009-0924-z, pmid:20066485. (2010) Anxiolytic-like effects of 8-acetylene imidazobenzodiazepines in a rhesus monkey conflict procedure. Neuropharmacology 59:612–618, doi:10.1016/j.neuropharm.2010.08.011, pmid:20727364. (1995) GABA(A) receptor heterogeneity in the adult-rat brain—differential regional and cellular distribution of 7 major subunits. J Comp Neurol 359:154–194, doi:10.1002/cne.903590111, pmid:8557845. (2008) Hippocampal alpha 5 subunit-containing GABA A receptors are involved in the development of the latent inhibition effect. Neurobiol Learn Mem 89:87–94, doi:10.1016/j.nlm.2007.06.003, pmid:17638582. (2001) Dissociating hippocampal subregions: double dissociation between dentate gyrus and CA1. Hippocampus 11:626–636, doi:10.1002/hipo.1077, pmid:11811656. (2014) The role of alpha 5 GABA(A) receptor agonists in the treatment of cognitive deficits in schizophrenia. Curr Pharm Des 20:5069–5076, doi:10.2174/1381612819666131216114612, pmid:24345268. (2011) A novel α5GABAAR-positive allosteric modulator reverses hyperactivation of the dopamine system in the MAM model of schizophrenia. Neuropsychopharmacology 36:1903–1911, doi:10.1038/npp.2011.76, pmid:21562483. (2008) Which GABAA subunits are necessary for tonic inhibition in the hippocampus? J Neurosci 28:1421–1426, doi:10.1523/JNEUROSCI.4751-07.2008, pmid:18256262. (1999) Muscimol inactivation of the dorsal hippocampus impairs contextual retrieval of fear memory. J Neurosci 19:9054–9062, pmid:10516322. (1993) Selective hippocampal lesions abolish the contextual specificity of latent inhibition and conditioning. Behav Neurosci 107:23–33, doi:10.1037/0735-7044.107.1.23, pmid:8447955. (2013) Adult neurogenesis modifies excitability of the dentate gyrus. Front Neural Circuits 7:204, doi:10.3389/fncir.2013.00204, pmid:24421758. (1993) Spatial selectivity of unit activity in the hippocampal granular layer. Hippocampus 3:165–182, doi:10.1002/hipo.450030209, pmid:8353604. (2015) A computational theory of hippocampal function, and tests of the theory: new developments. Neurosci Biobehav Rev 48:92–147, doi:10.1016/j.neubiorev.2014.11.009, pmid:25446947. (2007) Pattern separation in the dentate gyrus and CA3 of the hippocampus. Science 315:961–966, doi:10.1126/science.1135801, pmid:17303747. (1981) in The psychology of learning and motivation, Conditioned attention theory, ed Bower GH (Academic, New York). (2014) Retroactive interference of object-in-context long-term memory: role of dorsal hippocampus and medial prefrontal cortex. Hippocampus 24:1482–1492, doi:10.1002/hipo.22328, pmid:25044872. (1995) Why there are complementary learning systems in the hippocampus and neocortex: insights from the successes and failures of connectionist models of learning and memory. Psychol Rev 102:419–457, doi:10.1037/0033-295X.102.3.419, pmid:7624455. (1998) Hippocampectomy disrupts auditory trace fear conditioning and contextual fear conditioning in the rat. Hippocampus 8:638–646, pmid:9882021. (2007) Dentate gyrus NMDA receptors mediate rapid pattern separation in the hippocampal network. Science 317:94–99, doi:10.1126/science.1140263, pmid:17556551. (1987) Hippocampal synaptic enhancement and information storage within a distributed memory system. Trends Neurosci 10:408–415, doi:10.1016/0166-2236(87)90011-7. (2013) The brain GABA-benzodiazepine receptor alpha-5 subtype in autism spectrum disorder: a pilot [11C]Ro15-4513 positron emission tomography study. Neuropharmacology 68:195–201, doi:10.1016/j.neuropharm.2012.04.008, pmid:22546616. (2007) Recall of fear extinction in humans activates the ventromedial prefrontal cortex and hippocampus in concert. Biol Psychiatry 62:446–454, doi:10.1016/j.biopsych.2006.10.011, pmid:17217927. (2004) Is the context shift effect a case of retrieval failure? The effects of retrieval enhancing treatments on forgetting under altered stimulus conditions in rats. J Exp Psychol Anim Behav Process 30:325–334, doi:10.1037/0097-7403.30.4.325, pmid:15506857. (2004) Diversity of inhibitory neurotransmission through GABAA receptors. Trends Neurosci 27:569–575, doi:10.1016/j.tins.2004.07.002, pmid:15331240. (2010) Trace and contextual fear conditioning is enhanced in mice lacking the alpha4 subunit of the GABA(A) receptor. Neurobiol Learn Mem 93:383–387, doi:10.1016/j.nlm.2009.12.004, pmid:20018248. (2012) Selective lesions of the dentate gyrus produce disruptions in place learning for adjacent spatial locations. Neurobiol Learn Mem 97:326–331, doi:10.1016/j.nlm.2012.02.005, pmid:22390856. (2002) Requirement for hippocampal CA3 NMDA receptors in associative memory recall. Science 297:211–218, doi:10.1126/science.1071795, pmid:12040087. (2002) Context specificity of excitation and inhibition in ambiguous stimuli. Learn Motiv 33:284–310, doi:10.1006/lmot.2001.1112. (2014) CA3 retrieves coherent representations from degraded input: direct evidence for CA3 pattern completion and dentate gyrus pattern separation. Neuron 81:416–427, doi:10.1016/j.neuron.2013.11.017, pmid:24462102. (1994) Hippocampal conjunctive encoding, storage and recall: avoiding a trade-off. Hippocampus 4:661–682, doi:10.1002/hipo.450040605, pmid:7704110. (2015) Dentate gyrus circuitry features improve performance of sparse approximation algorithms. PLoS One 10:e117023, doi:10.1371/journal.pone.0117023, pmid:25635776. (1995) Enhancement of latent inhibition in rats with electrolytic lesions of the hippocampus. Behav Neurosci 109:366–370, doi:10.1037/0735-7044.109.2.366, pmid:7619326. (2007) Reconciling reinforcement learning models with behavioral extinction and renewal: Implications for addiction, relapse, and problem gambling. Psychol Rev 114:784–805, doi:10.1037/0033-295X.114.3.784, pmid:17638506. (1993) Ibotenate lesions of the hippocampus enhance latent inhibition in conditioned taste aversion and increase resistance to extinction in conditioned taste preference. Behav Neurosci 107:996–1004, doi:10.1037/0735-7044.107.6.996, pmid:8136075. (2006) Effects of ventral and dorsal CA1 subregional lesions on trace fear conditioning. Neurobiol Learn Mem 86:72–81, doi:10.1016/j.nlm.2006.01.002, pmid:16504548. (2006) A computational theory of hippocampal function, and empirical tests of the theory. Prog Neurobiol 79:1–48, doi:10.1016/j.pneurobio.2006.04.005, pmid:16781044. (2013) Reassessing pattern separation in the dentate gyrus. Front Behav Neurosci 7:96, pmid:23908611. (1991) Complementary roles for the amygdala and hippocampus in aversive conditioning to explicit and contextual cues. Neuroscience 42:335–350, doi:10.1016/0306-4522(91)90379-3, pmid:1832750. (2013) A possible negative influence of depression on the ability to overcome memory interference. Behav Brain Res 256:20–26, doi:10.1016/j.bbr.2013.08.016, pmid:23948219. (2012) Benzodiazepine-induced anxiolysis and reduction of conditioned fear are mediated by distinct GABA(A) receptor subtypes in mice. Neuropharmacology 63:250–258, doi:10.1016/j.neuropharm.2012.03.001, pmid:22465203. (1973) Retrieval of memory in animals. Psychol Rev 80:163–194, doi:10.1037/h0034326. (1998) Reinforcement learning: an introduction (Massachusetts Institute of Technology, Cambridge, MA). (2014) Characterization of the role of adult neurogenesis in touch-screen discrimination learning. Hippocampus 24:1581–1591, doi:10.1002/hipo.22337, pmid:25074617. (2001) Effects of retroactive and proactive interference on word list recall in schizophrenia. J Int Neuropsychol Soc 7:481–490, doi:10.1017/S1355617701744049, pmid:11396550. (1994) Computational analysis of the role of the hippocampus in memory. Hippocampus 4:374–391, doi:10.1002/hipo.450040319, pmid:7842058. (1974) Cue-dependent forgetting. Am Sci 62:74–82. (1998) Episodic and declarative memory: role of the hippocampus. Hippocampus 8:198–204, doi:10.1002/(SICI)1098-1063(1998)8:3<198::AID-HIPO2>3.0.CO%3B2-G, pmid:9662134. (2011) Antidepressant-like properties of alpha 2-containing GABA(A) receptors. Behav Brain Res 217:77–80, doi:10.1016/j.bbr.2010.10.009, pmid:20965216. (1994) Hippocampal and amygdaloid involvement in nonspatial and spatial working memory in rats—effects of delay and interference. Behav Neurosci 108:866–882, doi:10.1037/0735-7044.108.5.866, pmid:7826510. (2000) Contextual control over conditioned responding in a latent inhibition paradigm. J Exp Psychol Anim Behav Process 26:157–173, doi:10.1037/0097-7403.26.2.157, pmid:10782431. (2005) Trace fear conditioning is enhanced in mice lacking the delta subunit of the GABAA receptor. Learn Mem 12:327–333, doi:10.1101/lm.89705, pmid:15897254. (2011) Presynaptic α2-GABAA receptors in primary afferent depolarization and spinal pain control. J Neurosci 31:8134–8142, doi:10.1523/JNEUROSCI.6328-10.2011, pmid:21632935. (2011) Pattern separation in the hippocampus. Trends Neurosci 34:515–525, doi:10.1016/j.tins.2011.06.006, pmid:21788086. (2004) GABA receptors containing the alpha5 subunit mediate the trace effect in aversive and appetitive conditioning and extinction of conditioned fear. Eur J Neurosci 20:1928–1936, doi:10.1111/j.1460-9568.2004.03642.x, pmid:15380015. (2011) Hippocampal lesion effects on occasion setting by contextual and discrete stimuli. Neurobiol Learn Mem 95:176–184, doi:10.1016/j.nlm.2010.07.001, pmid:20643219.